Dr. Shaden Marzouk, MD, MBA is a global healthcare leader. She is currently a Managing Director at AXA, driving innovations in health in Asia and in other regions in the world. 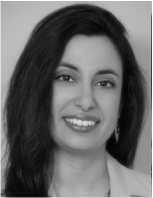 Dr. Marzouk began her healthcare career as a neurosurgeon, also serving in Iraq as a US Army Major. After receiving her MBA at The Fuqua School of Business, Duke University, she joined Goldman Sachs in New York in the healthcare group in the investment bank. Shaden went on to Cardinal Health and as Chief Medical Officer, led clinical operations and medical affairs worldwide.